Consumer Action’s education partners at the Louisiana State University AgCenter took part in a forum addressing the social impact of the Deepwater Horizon Oil Spill. Consumer Action's multilingual consumer education materials played a role in the event. 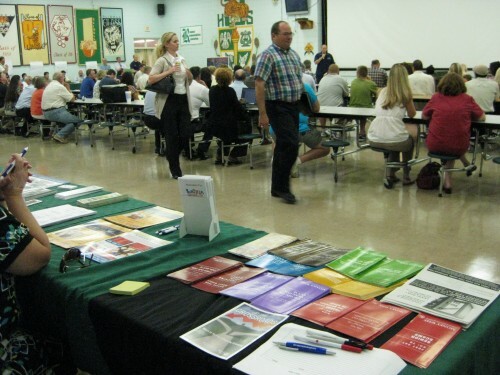 On June 1, 2010 local residents had a chance to speak one-on-one with representatives from state and local agencies concerning the effects of the Deepwater Horizon Oil Spill at a forum hosted by the LSU AgCenter and Louisiana Sea Grant to empower coastal citizens to make informed personal and community decisions. While individuals had the opportunity to meet experts at agencies including the state departments of Health and Hospitals and Wildlife and Fisheries, as well as the National Oceanic and Atmospheric Association, BP and the U.S Coast Guard to have their environmental questions answered. The event also hosted a human service section for residents. At the Human Services table along with representatives from the LSU AgCenter were the Department of Social Services, Department of Health and Hospitals, the United Way and Volunteers of America-LACHIP Program. Collaborations were key to the events success. One such collaboration could be found at the LSU AgCenter Human Service table where information was being distributed in multiple languages. The information relating to financial management in Vietnamese, Spanish and English was made available by Consumer Action. The “MoneyWi$e” materials were provided by a partnership between Consumer Action and Capital One and were a great example of resources available. “At the AgCenter we have many materials in English and some in Spanish, however when this challenge presented itself Consumer Action helped us to bridge the gap and provide much needed materials in a timely manner” Vincent said. Residents gathered information on Disaster Supplemental Nutrition Assistance Program (formerly Food Stamps), insurance programs, financial management, and Parish Government community resources. For more information on the Deepwater Horizon Oil Spill visit http://www.doi.gov/deepwaterhorizon/index.cfm or http://emergency.louisiana.gov. Consumer Action thanks Valerie Vincent for this timely article.